Midfielder Jordan Cook still has a future at Kenilworth Road despite his red card picked up during the first half at Grimsby Town on Saturday. 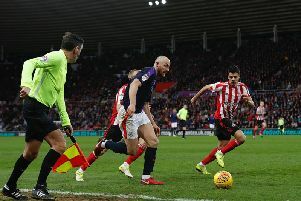 The former Sunderland and Walsall player was making his first league start of the season, only to be booked twice for two reckless challenges and received his marching orders. Although admitting he has to see more from Cook in a Luton shirt, when asked if could still feature in the promotion run-in, Jones said: “Yes, of course, he’s a part of that. “I believe in him, I trust him, I put my reputation on the line for people like Olly Lee and they’ve repaid me. “I’ve done it for Jordan, but I need to see a bit of repayment and the onus is on him to step up and to do that, because he’s a wonderful footballer and it’s not like he hasn’t done anything. “As I keep saying, last year, all our big games, our big wins and big performances, Jordan played in them and contributed. Cook was quick to apologies for his actions, blaming his actions on being overeager to impress on his rare outing for the Hatters. It was something Jones could acknowledge played a part, although he knew there were better ways to channel such enthusiasm. He continued: “Of course you do and I understand a lot of things. “I understand why Alan Sheehan got sent off, the frustrations of wanting to impact, but there’s certain ways to do that and I’d rather he stick one in the top bin, or to do an extra kilometre in running because he was eager and be stiff today because of that. “There’s no point when you’re on a booking, trying to impress and hit someone out of touch, and get a second booking, that isn’t eager to impress, that’s a surefire way to annoy someone. The midfielder came in for a fair bit of criticism on social media after the event and Jones now wants him to prove to fans he can still make a success of his Luton career, adding: “He was distraught and you’d expect that from him. “The thing about it is, he’s such a good kid, I really like him, he’s such a popular member of the squad and how he trains and what I see in him and what I have seen in him, he’s just not showing that at the minute. "Then when he does things that are silly, then it doesn’t endear himself to a lot people and people criticise certain things. “It didn’t cost us as much as it could have, but I want him to impact and show what he shows me, I want him to show others, so they can see what I see. "But at the minute he’s not doing that and that’s the big thing as I can’t keep, if you like, giving him opportunities when I’m not exactly looking foolish for it, but I need him to be what I know he can be. "As if he is, he’s a wonderful, he’s above the level player."